The Casto House and Northfield Museum offers a rare glimpse of a historic southern New Jersey community. Like archeologists, visitors can uncover the layers of an evolving city. Northfield residents can rediscover their memories of earlier days and learn about those who came before them. Once known as Bakersville, Northfield has a multifaceted, fascinating history; from its farm, seaport, and shipbuilding beginnings to its diverse, dynamic present. The museum buildings and exhibits represent almost 200 years of people, homes, schools, businesses, places of worship, toys fashion, sports, and so much more. In 1996, the Charles Doerr family very generously donated the historic Casto House to Northfield, with the stipulation that it be moved from its New Road location. The property was being sold and the house, if not moved, would be demolished to make way for new construction. 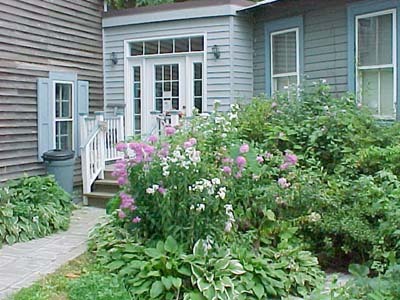 On August 22, 1996, the house was moved to Birch Grove Park, adjacent to the Northfield Museum. Four years of planning, construction, exhibit development, and renovation ensued, with the grand reopening of the Casto House and Northfield Museum held on June 25, 2000. This was the conclusion of a process, coordinated by Joyce Pullan and Roy Clark, involving the city of Northfield, suppliers, and dedicated volunteers, especially from the Northfield Cultural Committee and the Northfield Historical Society. Although it has not been possible to determine the exact construction date of the Casto House, it certainly dates from the earliest days of Bakersville. Research done by Joan Berkey, a house historian, supports the conclusion that it was probably built between 1750 and 1820, possibly by Clement Ireland (?-1835). The house and rear addition appear in a crudely drawn sketch on a property division map done in 1860. Hosea Casto (1814-1857) purchased 4.5 acres from Clement Ireland in 1835, and, in 1842, acquired an adjoining acre, which suggests the addition of a house on the original 4.5 acre lot. After Hosea Casto's death, the property passed to his son Jacob (1846-1917), then to Jacob's son Joseph (1894-1969). Joseph's wife Marian Morgan Casto continued to live in the house until her death in 1995, when the property was inherited by Charles Doerr. The original Northfield Museum building dates from about 1915. Built as an office, it was located at Mill Road and Wabash Avenue. In the 1930s it was moved NEXT to City Hall, renovated as a Works Progress Administration project, and, in 1938, dedicated as the Northfield Library Building. It served as Northfield's library until 1969, when the library was relocated to the new City Hall. The building was then moved next to the City Municipal Garage and used for storage. In 1975, the Bicentennial Committee (now the Cultural Committee) had this historic building moved BEHIND City Hall, and, in 1976, commenced operating the Northfield Bicentennial Museum. It was moved to Birch Grove Park in 1989. Visitors to the Casto House and Northfield Museum enter through the Gallery, with its multimedia displays of artifacts and photographs of city businesses, and places of worship. One display illustrates the history of Birch Grove Park, from its time as the brickyard of the Somers Brick Company and the Somers/Frambes Company, all the way to the Park as it is today. The Casto Room exhibits illustrate the history of the Casto House and the family that owned it for almost 200 years. On one wall is a display of handmade squarehead nails used in construction of the house and discovered during renovation. Another exhibit is an undated newspaper article showing the house as it looked many years ago. The Old School Room celebrates the long history of Mill Road School (1914-1997), for many years Northfield's only school, plus other Northfield schools: Kresge, Locuson, Mt. Vernon, and Bayside. Desks, signs, clocks, coat racks (with gum! ), teachers' mailboxes, and other memorabilia are on display. The walls are covered with school class pictures, from about 1895 to the present, with many of the students identified. Can you find the student who brought his dog to school with him? Pictures show many of the teachers and administrators remembered by so many former students. Band memorabilia include band pictures, uniforms, and instruments. 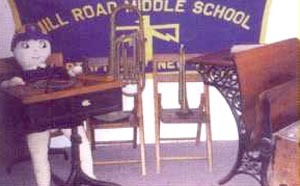 The "school band drum" was donated by someone who purchased it at a garage sale. The City Room displays include photos and memorabilia of Northfield government officials, police, and firefighters. Wall racks hold photos and both old and new newspaper articles illustrating many of the city's noteworthy homes, citizens, sports teams, and clubs. 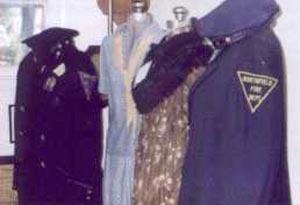 Among the clothing on display is a daytime dress from about 1800, owned by Deborah Adams; a uniform owned by William (Bud) Lever, police chief 1929-1961; a fire department uniform from 1960; and a Red Cross Gray Lady Service uniform from World War II. 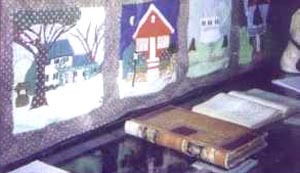 Exhibits in the Original Museum include a detailed 1904 map of then-Bakersville Bicentennial quilts created in 1976 by city citizens are on display; each panel highlights a different aspect of the city - some places still in existence. Other displays include items of apparel such as shoes and hats from the late 1880s, the wedding veil worn by (Mrs. Otto) Gussie Bruyns, with box marked $2.95, and a fur coat worn by Miss Lizzie Price, the city librarian from 1926 to 1947. Some exhibits give a glimpse of daily activities: the daily ledger of customer purchases at Ryon's general store, a Northfield city ledger covering 1905 to 1918, and the daily police log from 1937. Thanks to the efforts started by Nick and Claire Hillyer, the Gardens at Casto House and Northfield Museum provide colorful year-round horticultural displays. The gardens include the boxwood hedge, roses and flox transplanted from the original Casto House location on New Road. 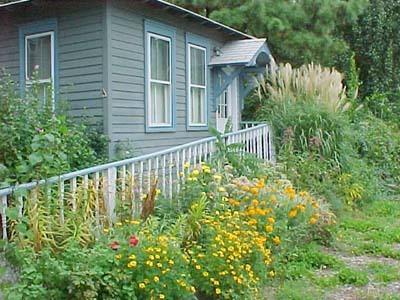 The wooden zigzag fence is fashioned from the fence that bordered the front yard of the Casto House for many years. Look closely at the seat in the garden. It is constructed from the carved stone lintels that for so many years were over two of the Mill Road School front doors. Northfield Museum Archive- created by Emily Shenkus, MRHS student in 2018.